A 100 Great Geosites nomination from the Geological Society’s President, David Shilston. I discovered the hidden and diverse delights of this valley and its route up/down Snowdon only a few years ago. It has so many interesting features – geology, history, politics and ecology. Importantly, one can visit as a serious hill walker or as a Sunday stroller. There is good accessibility, and one can enter the heart of this wonderful mountain valley with only a little effort – you don’t have to climb Snowdon! 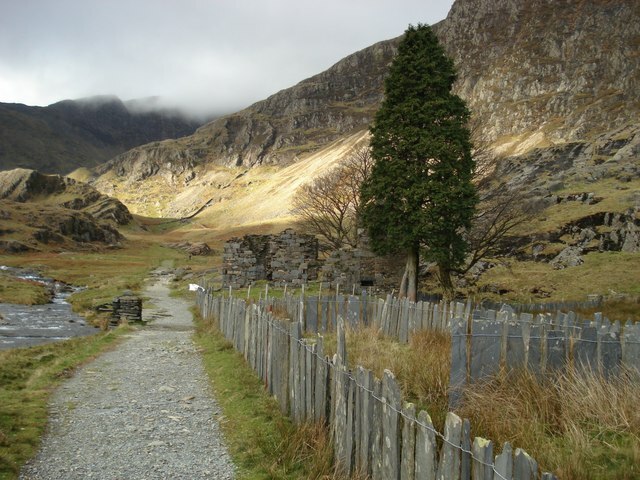 The Watkin path was named after Sir Edward Watkin, Liberal Member of Parliament and railway entrepreneur who retired to a chalet in Cwm Llan on the foothills of Snowdon. A track to the South Snowdon Slate Quarry through Cwm Llan already existed, so to enable visitors to walk all the way up Snowdon, Edward Watkin created a path from the quarry to the summit. This was the first designated footpath in Britain, and the first step towards opening the countryside to walkers. The path was officially opened in 1892 by the Prime Minister William Gladstone, who was 83 years old at the time. He addressed a crowd of over 2000 people from a rock on the side of the path, which is known today as the Gladstone Rock. This path is widely thought to be one of the hardest going routes up Snowdon, rising from just above sea level to around 3560feet in 4 miles. But for much of its length it climbs slowly. 1: Starting from the National Trust’s farm, Hafod y Llan, you can see the glacial valley unfold before you. 3: A beautiful waterfall of the Afon Cwm Llan, which is close to the new pool created to provide the start of the small hydroelectricity generating scheme. 4: At this point you pass the ruin of the crushing mill that was part of the Hafod y Llan copper mine with the mine located on the slopes of Y Lliwedd to the right. 5: Here stands the famous Gladstone Rock. Just before the rock you pass the ruin of Plas Cwm Llan, the home of the South Snowdon Slate Quarry’s manager. Beyond Gladstone’s rock the path takes you through old Slate Quarry with the ruins of the workmen’s barracks to the left. 8: Just before final accent you will find the Bwlch y Saethau where, according to the legend, King Arthur has struck by an arrow. 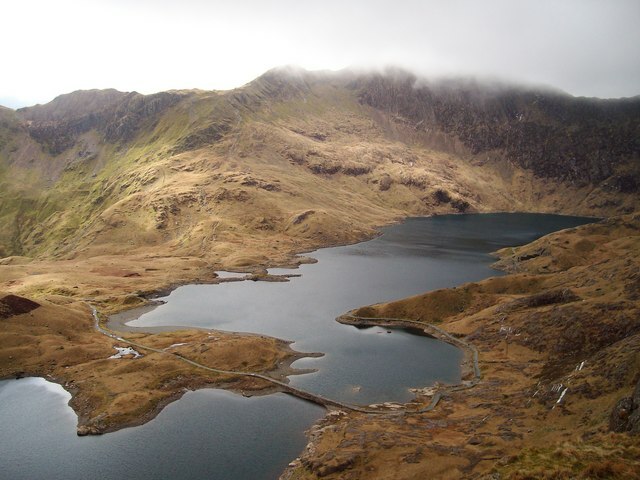 Bedwyr (Bedivere) carried the King down to Llyn Llydaw Lake, and as he passed Llyn Glaslyn he threw Excalibur in the lake. 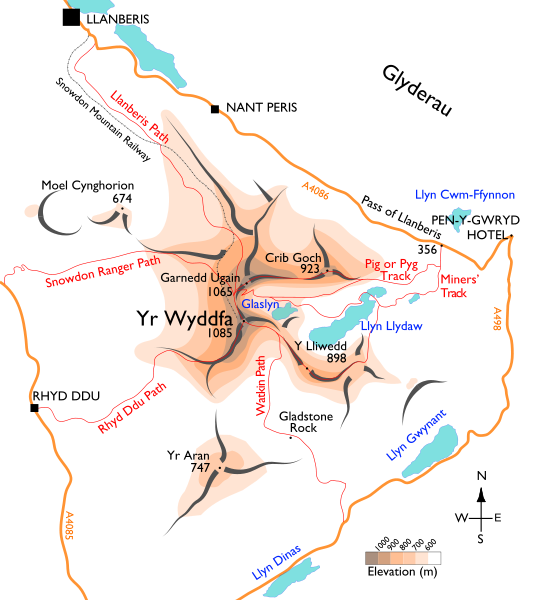 Central Snowdonia consists mainly of rocks of Ordovician age, which are a mixture of volcanic rocks, sediments (including muds that are metamorphosed into slate) and intrusive igneous rocks. All of Snowdonia has been strongly influenced by extensive glaciation. Evidence for erosion of the rock and deposition of glacial sediments is all around. The Watkin path winds up Afon Cwm Llan – a classic example of a glacial valley. 45% of the National Park is moorland – important as a store for gases connected with climate change. The presence of woodland depends on drainage, and whether grazing occurs. Many of the slopes which would once have been tree covered have been cleared by agriculture, and the return of woodland on the higher slopes is kept to a minimum by grazing of sheep and cattle. And finally – a virtual fly-through! 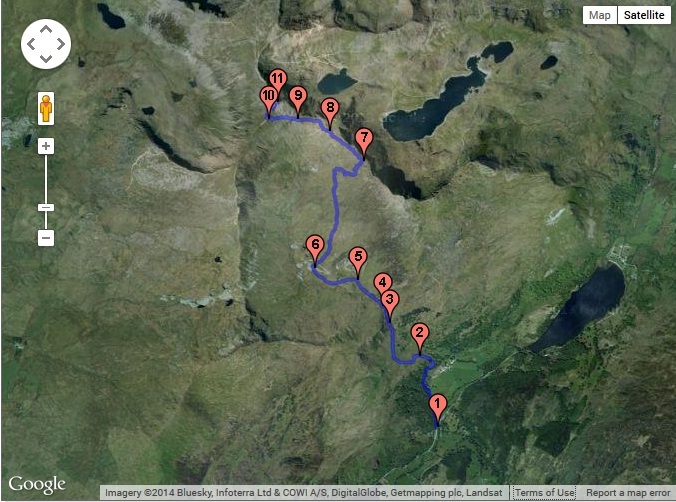 Tags: 100geosites, climbing, geography, geology, glaciation, history, Snowdon, watkin path. Bookmark the permalink. Llyn Llydaw: amazing place and amazing picture.